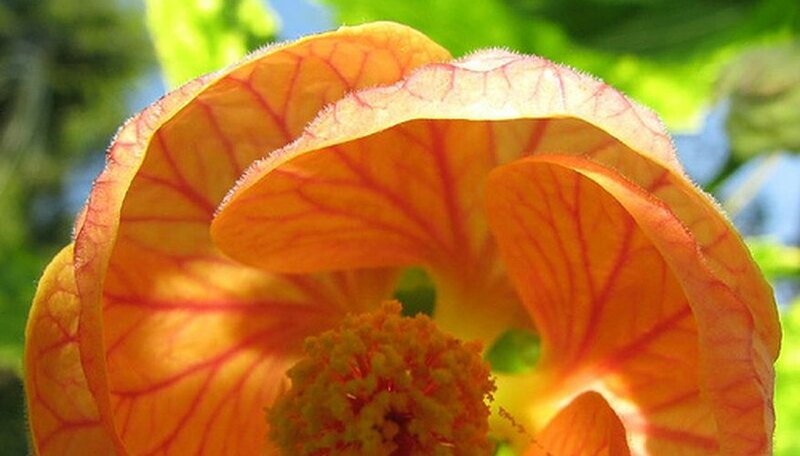 Abutilon is commonly known as flowering maple, although it shares no relation to the tree. The plant was so named due to its broad, lobed leaves, which look very much like maple leaves. When provided with proper care, abutilon plants will produce beautiful flowers nearly year-round in pink, yellow, orange or red, depending on the variety. They are typically grown in containers, as they cannot tolerate extreme weather, but abutilons can be grown outdoors and indoors with success. Plant abutilon in an area that receives full to partial sun and has fertile, well-drained soil. Plant in containers if the temperature in your area drops below 35 degrees in the winter or rises above 75 degrees in summer. Abutilon plants can be grown outdoors during warm periods and brought indoors during extreme weather. Water abutilon plants thoroughly and don't water again until the top inch of soil is dry to the touch. Indoor plants may require weekly watering, while outdoor plants may go longer without water, depending on the environment. Water more frequently when temperatures are high. Mist the air around abutilon plants using a spray bottle filled with lukewarm water during the winter months. This will increase the humidity around the plants, which will prevent spider mite infestations when the air is very dry. Feed abutilons once every two months during the spring, summer and fall months using a balanced houseplant fertilizer. Feed only once per month during winter, as the plants grow more slowly during this time. Refer to the manufacturer's directions for proper dosage and application. Pinch back stems occasionally throughout the summer months to promote full, bushy growth. Prune the entire plant in early spring, removing about 1/3 of the growth with pruning shears. This will prevent leggy growth and keep abutilon plants compact. Repot young container-grown abutilon plants once every six months for the first three years to accommodate the growing root system. Move to a slightly larger pot each time. Plants should fill an 8-inch container after the third year and should not be repotted again. After three to four years of growth, abutilon plants become woody and unattractive. Propagate new plants from cuttings after this time, and discard the parent plant. High heat will force abutilon plants out of bloom. Underfertilized abutilons will develop light-colored leaves and may experience leaf drop. The plants are heavy feeders, so make sure to fertilize regularly, particularly if grown in containers.